Here you will find the current editions of the Psi Chi Digest, Psi Chi Journal of Psychological Research and Eye on Psi Chi. 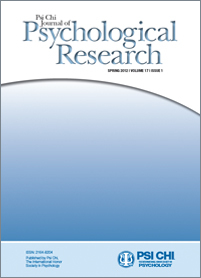 The purpose of the Psi Chi Journal of Psychological Research is to educate, support and promote professional development, and disseminate psychological science. Through the Psi Chi Journal, members can build research skills in the process of receiving thoughtful, detailed, and rigorous feedback on their work. A supportive review process leads to publication. Publications provide recognition and evidence of scholarly productivity of authors. Published manuscripts are original and empirical, making a contribution to psychological knowledge. Psi Chi Journal authors are Psi Chi members at the undergraduate, graduate, and faculty levels. Work of undergraduate students may be less complex in design, scope, or sampling than that of graduate students or faculty authors. The peer review process takes into account developmental stage in the evaluation of each submitted manuscript. Three professionals review each submission. Each issue of the Psi Chi Journal is a compilation of scientifically rigorous reports across the professional developmental spectrum. The magazine Eye on Psi Chi published by the International Honor Society in Psychology, is designed to keep members and alumni up to date with all the latest information about Psi Chi’s programs, awards, and chapter activities, as well as to provide a listing of new members, officers, and advisors. Eye on Psi Chi also features informative articles about careers, graduate school admission, chapter ideas, personal development, the various fields of psychology, and important issues related to our discipline. First published in the fall of 1996, Eye on Psi Chi is the successor of the Psi Chi Newsletter, which had been published for the previous 66 years from 1930 to 1996. Eye on Psi Chi was inaugurated to expand the scope of the Psi Chi Newsletter by presenting a broader spectrum of news and pertinent information in a fresh, colorful format. All Psi Chi members who are active at the chapter level receive copies of Eye on Psi Chi through their local chapters. Members and alumni who wish to have the publication mailed to a home address must subscribe to the magazine.